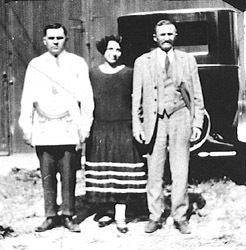 Johann Aron (far right) with his grand-daughter Fannie and her husband Fred Schleicher. Johann was born 1848 in Molidorf and made a couple of trips back and forth between the U.S. and Molidorf. The first time coming to Ellis Island in 1905. He later returned to Molidorf to bring his wife (Susanna) and grand-daughter Fannie to the U.S. with him. They all came to the U.S. on the Carpathia in 1914. During the trip, WW1 was set in motion by Ferdinand's assasination and it was announced on the ship. Johann died in Detroit in 1925. Fannie passed away in 1986. Photo taken in Detroit in the 1920's. 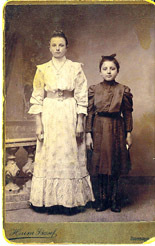 Elizabeth (left) and her niece Fannie Aron. Photo was taken in Hatzfeld around 1905. Both girls were born in Molidorf, and later came to the U.S. (Michigan). Johann Aron (name later changed to "John Aaron" in the U.S.) He was born 1876 in Molidorf. Came to the U.S. (Ellis Island) in 1904. Originally came to Cincinnati, though settled in Michigan shortly after. This photo was taken in Detroit where he was working for a time as a street car conductor. He passed away after a fall at the Carpathia Club in Detroit in 1934.